NO I DON'T HAVE A MOBILE. NO I DON'T WANT A MOBILE. I'm constantly being harrassed told harrassed by my friends that I should have a mobile. Well, I do have one, but it's out of charge, out of credit, and I don't know where it is. Well, I do know where it is, but I'm not getting it. I hate the bloody things. For lots of reasons, none of which make any sense to most people. I don't like it that someone could ring me at any time on it. If I'm out shopping, or enjoying time with my family, or on a date with my husband, or whatever, I don't want phone calls. And I don't want the extra hassle of remembering to turn it off and on, so don't offer that as a solution, please. There are plenty of times when I just want peace and quiet, to be alone with myself, to think or to just be. I don't need phone calls in the middle of that. It jangles me. I don't like it that when I'm enjoying time with someone, and their phone rings or dings, EVEN IF they are polite enough not to answer it, their eyes dart to it constantly, and their fingers twitch. You know what that says to me? it says that I am not interesting enough to hold your attention. You know the worst part about that? my husband does it. I know it's for work. I know it could be a call to say that one of our guys has been hurt or something horrible. BUT. I feel shunted aside. And it spoils the entire outing. I think I'm pretty good at keeping in touch with people. I have a LANDLINE, which you can call me on at any (normal) hour, and I have Facebook. I don't think I need to attach myself to a phone 24/7. Here's another thing that absolutely drives me crazy. 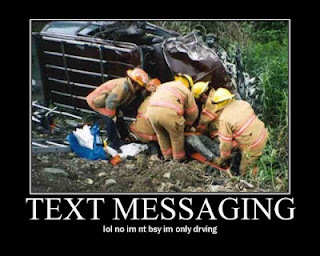 IF YOU'RE DRIVING, AND THE PHONE GOES OFF, DON'T ANSWER IT! Seriously. What is the WORST that could happen if you ignore the call until you get where you're going? if you're concerned that it might be urgent, PULL OVER. NO PHONE CALL IS WORTH YOUR LIFE, OR SOMEONE ELSES, IN A CAR ACCIDENT. And the worst part about that? My husband, who is a fairly sensible bloke in every other way, can't pull over. He fiddles with calls and even reads text messages while driving. I love him to bits but I want to smack him every time he does it. He could kill someone. He could kill himself. For a frigging text message. So, no, for all intents and purposes, I do not have a mobile. And I won't be getting one. I have one. It sits in my bag while I am out because I'm uber paranoid that something will happen to the kids while I am shopping and the school wont be able to reach me. Other than that I never use it. SMART girl! stupid things. I'm sure they're the Devils Contraptions. It IS rude, isn't it? I have one and I hear the ring tone when a message comes in, but most of the time I don't bother checking those until I get home. I don't have a landline, so I'll keep the mobile, but it is rarely used. We email each other in my family. Oh my gosh! same, same. My husband would die without a mobile, like it is an umbilical cord. I couldn't give a stuff whether I had one or not! But he did buy me one for christmas and I love it. But it is always out of credit or flat, I only use it at home really when it runs on wireless internet and mostly use out of the house for photos! 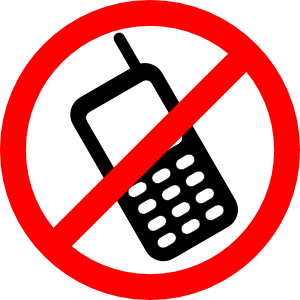 My mobile is for MY convenience - it's switched off most of the time and I rarely make calls from it, but it means I CAN be contacted in an emergency when I'm on the road and - ever increasingly - there's no working public phone around. That's the only reason I hang on to the blessed thing. OH!! that's brilliant, I'm so doing that next time my husbands' phone rings while we're having a meal!